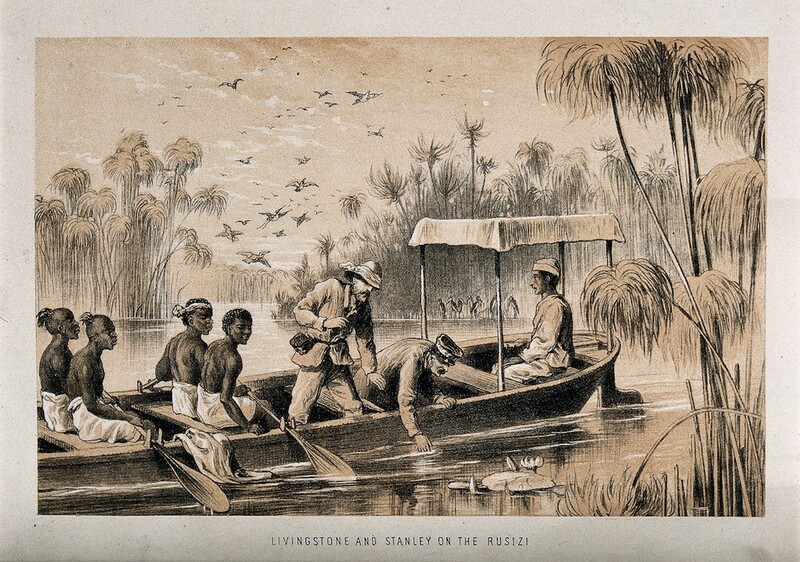 Lithograph of Henry Morton Stanley and David Livingstone on the River Ruzizi. Image courtesy of Wikimedia Commons. Blumenbach kindled scientific interest in whiteness when he claimed to have found five distinct varieties of humankind in his collection. While he thought these varieties—which he called “races” in 1795—were more or less equal in character and intelligence, Blumenbach ranked them in terms of what he saw as their physical perfection. Taken from the body of an unnamed Georgian woman in the Caucasus, Blumenbach’s favorite skull became the basis of his “Caucasian” race, and with that, a scientific typology of whiteness was born. Supporting the hierarchical theories of the new “race science” took work, which can be seen in the strange—and retrospectively unbelievable—discoveries of lost white tribes that proliferated in the late 19th and early 20th centuries. While none of these clans proved to be white in the racial sense intended by explorers, the legacy of these “lost tribes” continues to quietly but indelibly shape the lives of millions of people from Rwanda to India. The lost tribes grew out of the Blumenbach’s central theory: that Caucasians were the original human type, a form that changed—or, in his word, “degenerated”—into other racial forms as Caucasians migrated from an ancestral homeland in the Caucasus Mountains to other areas of the world where they encountered the effects of new climates. This idea was bolstered by British scholar William Jones, who believed he had unearthed evidence of an original human type from his study of languages. Finding structural similarities among ancient languages of the West (Latin, Celtic, Ancient Greek) and the East (Old Persian, Sanskrit) he posited an early homeland for humankind somewhere in the lands that lay between. That such a homeland was close to the Caucasus—as in Blumenbach’s hypothesis—as well as Mt. Ararat, the Biblical site of the homeland for those who survived the Flood, gave weight to the idea that humanity first emerged in Central Asia then migrated outward to populate other regions of the world. By the late 19th century, this ancient people of Central Asia had been given a name: Aryans. That idea that a white race had once existed in Central Asia and left home to conquer the world was not popularized merely by zealots and xenophobes, but also by leading members of the scientific community. Among scholars of Africa, it was called the “Hamitic Hypothesis,” after Ham, son of Noah, who was mistakenly identified as the common ancestor of all African peoples. Egyptologists called it the “Dynastic Race Theory.” Linguists described it as the “Aryan Invasion Theory.” Among European anthropologists, it was called the “Nordic Race Theory.” While each of these theories had its own variations, they all promoted the idea that a light-skinned, racially superior population left its ancestral homeland to conquer Europe, Africa, and Asia in the ancient past. Not all scientists subscribed to these theories. How human races were related—if they were related—remained a matter of debate in the 19th century. Scientists also disagreed about the extent of racial difference. Was it a superficial attribute of skin and hair or did it touch the deeper qualities of temperament and intellect? Finally, there were doubters—the most prominent of whom was Charles Darwin—who thought that the homeland of the human species lay elsewhere, probably in Africa. Still, these voices of dissent barely impacted the seductive idea of the ancient white invasion. By the turn of the 20th century, it was lodged firmly within the fields of linguistics, physical anthropology, and, among African scholars, history and archaeology. Across the world, colonial officials categorized peoples—Ainu, Maori, Tutsi, Brahmin—according to their supposed connection to an ancestral white race, while others—Hutu, Pygmy, Dravidian, Ati—were labeled native or black, creating a global racial caste system that was enforced through European colonization. Illustration of the “five races” identified in a treatise by German anatomist Johann Friedrich Blumenbach. Image courtesy of Wikimedia Commons. While there’s little doubt that explorers were seeing real physiological differences among different groups, they were interpreting them according to categories of race imagined by Blumenbach and filtered through popular ideas of white ancestry. Whiteness, after all, is not a color but an idea. There is no simple way to determine ancestry according to a person’s pigment. So explorers did what we so often do—size people up by their hair, facial features, language, clothing, and comportment. In short, the discovery of “white tribes” was less an anthropological discovery than a psychological one: a Rorschach test in which Europeans—confronted by figures that seemed ambiguous—made sense of them using deeply held beliefs about race and history. None of these beliefs turned out to be true. Blonde Eskimos are the Copper Inuit (Kitlinermiut) of Banks Island—the descendants of an early Thule migration out of Asia. The Ainu of Hokkaido, physically distinct from the Japanese of other islands, are genetically similar to South Asian populations, not European ones. Richard Marsh’s “white Indians” turned out to be Cuna Indians who expressed a form of albinism. Scientists gradually abandoned theories of white invasion in the decades after World War II as a result of scientific discoveries, as well as a newfound revulsion for the excesses of racial thinking that had led directly to the Holocaust. All these misconceptions might seem a strange, innocuous curiosity of history were it not for the fact that these theories continue to thrive and cause harm despite their repudiation. In the early 1900s, the Aryan invasion theory of India became popular with Brahmin scholars and statesmen who tried to explain, and sometimes defend, the caste system which placed Brahmins in positions of power. Between 1965 and 1979 the apartheid government of Rhodesia (now Zimbabwe) was eager to promote the idea that white settlers, not Africans, had built Great Zimbabwe, going so far as to exile archaeologists who said otherwise. Most tragic was the role of the white invasion myth in the Rwandan genocide of 1994. Over the course of the twentieth century, many Tutsis of Rwanda—portrayed as being of white or proto-white ancestry rather than of African descent—were praised by their colonial overseers as being more advanced than the Hutus and given positions of power in the colonial administration. When this era came to an end, Hutus took power and used the invasion myth to express their grievances. The extremist Hutu radio station Radio Télévision des Milles Collines fanned the flames of Hutu rage, calling for the end of the “invading Tutsis.” While the Rwandan Genocide has many causes, it was encouraged by the idea that Tutsis were not truly African. They were, in this racial myth, foreigners who had usurped power from the native Hutus who were the rightful occupants of the country. Today the most visible heralds of white supremacy are those who play dress-up in Nazi uniforms or Klan robes. But the greater danger is the legacy of white supremacy that still exists out of sight—sown by European scientists and colonial officials in the 19th century, but continuing to perpetuate ethnic divisions across India and Africa today. These hateful ideas—the final echoes of a theory of white prehistory—will shape the world long after the last tiki torch has been extinguished. Michael Robinson is a historian of science at the University of Hartford and the author of The Lost White Tribe: Explorers, Scientists, and the Theory that Changed a Continent.